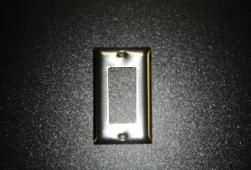 The Stainless Steel One Gang Wall Plate is Made in the USA. These high quality residential grade stainless steel switch plates and outlet covers will add a contemporary look to your new kitchen, bath, or dining area while coordinating beautifully with stainless steel appliances, sinks, and faucets. These plates are offered as a convenience. We do not make these plates and they may be available in you local area at a little better price. If you don’t see what you need, contact us and let us try to help.